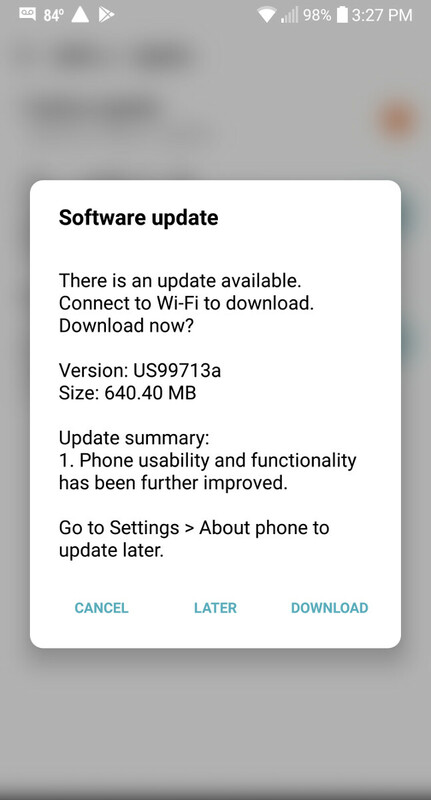 Starting today, July 10, US owners of the unlocked LG G6 (model number US997) should begin noticing that there's a software update available for their smartphone. The new update is pretty big, weighing in at 640.40 MB, and yet LG doesn't provide detailed information on what it contains. According to the screenshot on the left - sent in by one of our readers - the update improves "phone usability and functionality." As vague as that may sound, it certainly looks like this is an update that you should go ahead and download as soon as possible. The update also includes an Android security patch. Unfortunately, it's not the July patch (released by Google last week), but the patch for June. Well, that's still better than having an older patch, right? If you own an unlocked LG G6 in the US and you've received this update, let us know if you're seeing any performance improvements, will you? The patch is just one month back and it's nearly the middle of July anyway. still better than moto. They are in dead last for updates now. I'm getting significantly better battery life today. Had been getting down to 30%-50% at the end of the day. It's 2:23 pm & I'm at 90%. Had also had issues with the phone not syncing w/ various apps after not rebooting for 3 or 4 days. Rebooting fixed that. That issue seems to be a lot better on Verizon. Time will tell. Finished the day yesterday with 74% left. Wild.